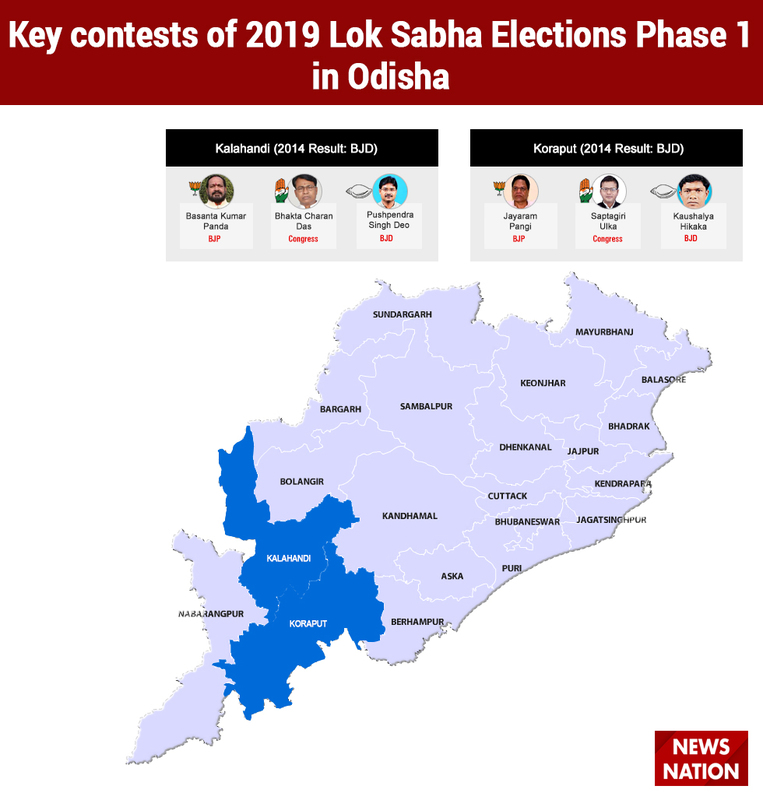 Voters in 91 constituencies will use their franchise on April 11 in the first phase of the 2019 Lok Sabha Elections. 20 states and Union Territories will go for polls in the first phase. 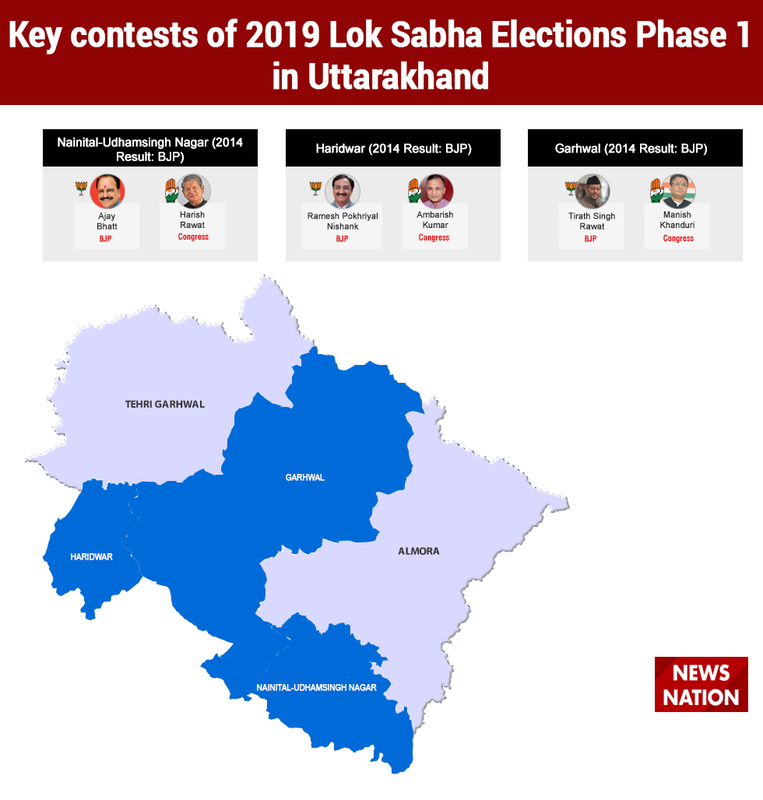 Lok Sabha Elections 2019: Kalvakuntla Kavitha, Congress leader Harish Rawat, BJP leader VK Singh, Union Minister Nitin Gadkari, BJP leader Mahesh Sharma, RLD leader Ajit Singh and Asaduddin Owaisi are some of the key contenders. 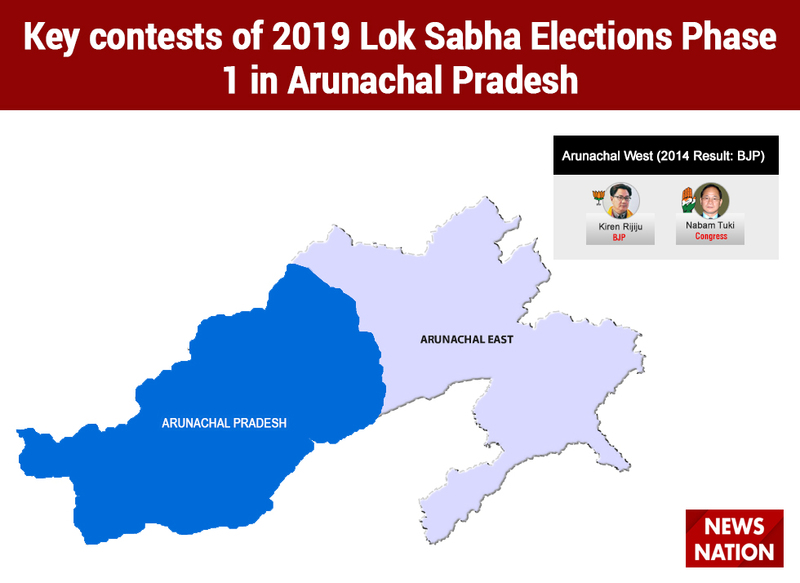 Lok Sabha Elections 2019: Voters in 91 constituencies will use their franchise on April 11 in the first phase of the 2019 Lok Sabha Elections. 20 states and Union Territories will go for polls in the first phase. Voting process will be completed in Andhra Pradesh (25 seats), Telangana (17 seats), Uttarakhand (5 seats), Arunachal Pradesh (2 seats), Meghalaya (2 seats), Nagaland (1 seat), Sikkim (1 seat), Mizoram (1 seat), Andaman and Nicobar Islands (1 seat) and Lakshadweep (1 seat). Other states which are going for polls are Uttar Pradesh (8/80 seats), Maharashtra (7/48 seats), Assam (5/14 seats), Bihar (4/40 seats), Odisha (4/21 seats), West Bengal (2/42 seats), Jammu and Kashmir (2/6 seats), Tripura (1/2 seats) and Manipur (1/2 seats) and Chhattisgarh (1/11 seats). Some of the key constituencies in the first phase of elections are Ghaziabad, Baghpat and Gautam Buddha Nagar in Uttar Pradesh, Nagpur and Chandrapur in Maharashtra, Tura in Meghalaya, Kaliabor and Dibrugarh in Assam, Arunachal West in Arunachal Pradesh, Gaya and Jamui in Bihar, Kalahandi and Koraput in Odisha, Hyderabad, Nizamabad and Nalgonda in Telangana, Baramulla in Jammu and Kashmir, Bastar in Chhattisgarh, Cooch Behar in West Bengal, Nainital-Udhamsingh Nagar and Garhwal in Uttarakhand and Visakhapatnam, Kurnool and Vizianagaram in Andhra Pradesh. 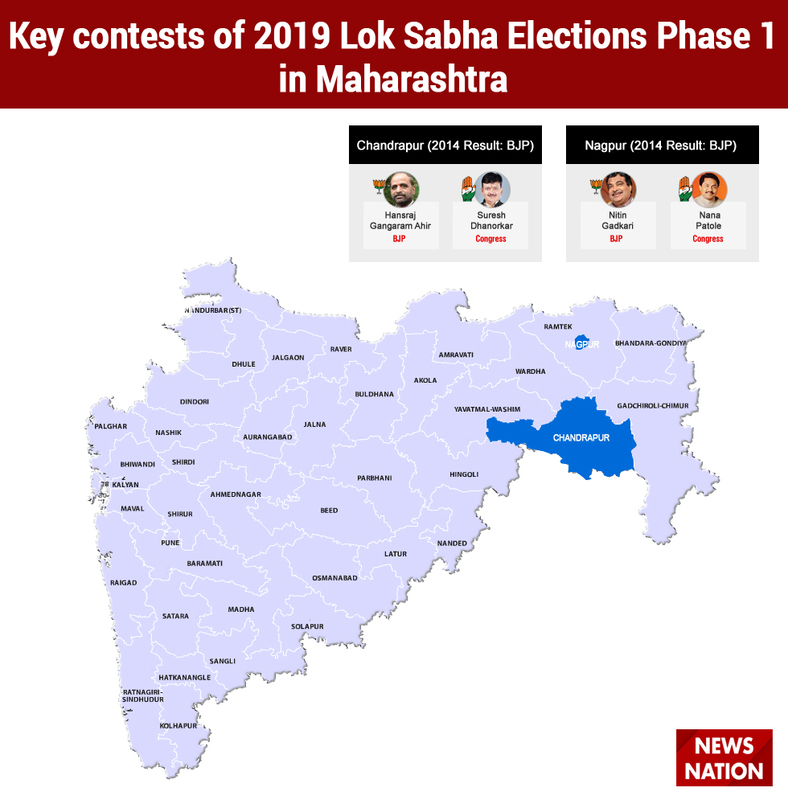 Several prominent candidates are in the fray in the first phase of elections – Nitin Gadkari, Mahesh Sharma, VK Singh, Ramesh Pokhriyal Nishank, Daggubati Purandeswari, Chirag Paswan, Jitan Ram Manjhi, Harish Rawat, Nana Patole, Asaduddin Owaisi, Renuka Choudhary, Kalvakuntla Kavitha, Hansraj Gangaram Ahir, Gaurav Gogoi, Muhammad Akbar Lone, Kiren Rijiju and Ashok Gajapathi Raju. Let's see the state-wise key constituencies and prominent candidates in detail. NTR's daughter and BJP leader Daggubati Purandeswari will be taking on M Bharat of TDP and MVV Satyanarayana of YSRCP from Visakhapatnam. In 2014, Purandeswari was defeated by YSRCP's PV Midhun Reddy by 1,74,762 votes in Rajampet. In 2014, BJP's K Hari Babu won the seat by defeating Jaganmohan Reddy's mother YS Vijayamma with a margin of 90,488 votes. In the last seven elections, the Congress was successful four times in 1996, 1998, 2004 and 2009. The TDP won it in 1991 and 1999 whereas the BJP won it for the first time in its history in the last elections with the TDP's backing. BJP state president Kanna Lakshminarayana will be contesting against TDP's sitting MP Sambasiva Rao Rayapati and YSRCP's Lavu Krishna Devarayal. In 2014, Rayapati defeated YSRCP candidate Ayodhya Ramireddy Alla by 35,280 votes. In the last seven elections, the Congress had won the seat four times in 1991, 1998, 1999 and 2004. The TDP grabbed the seat in 1996, 2009 and 2014. Former Andhra CM Kotla Vijaya Bhaskara Reddy's son and TDP candidate Kotla Suryaprakash Reddy will be fighting the battle in Kurnool against YSRCP candidate Sanjeev Kumar and BJP's PV Parthasarthi. Congress candidate Ahmed Ali Khan is also in the fray. In 2014 elections, YSRCP candidate Butta Renuka defeated TDP's BT Naidu by a margin of 44,131 votes. Suryaprakash Reddy was the Congress candidate that time and came third. In last seven elections, Reddy won the seat for Congress three times in 1991, 2004 and 2009. His father Vijaya Bhaskara won the seat for the Grand Old Party twice in 1996 and 1998. The TDP won it in 1999 whereas the YSRCP snatched the seat in 2014. Former Union minister Ashok Gajapathi Raju will be locked in a tough battle with YSRCP's Bellani Chandrasekhar and Congress candidate Yedla Adiraju. Raju was the civil aviation minister in the Modi Cabinet till 2018. The seat was established after the delimitation process in 2009. It was first won by the Congress party in 2009. In 2014, Raju defeated YSRCP candidate VSCKK Rangarao Ravu by 1,06,911 votes. BJP leader and Union Minister VK Singh is again in the fray from Ghaziabad. In 2014, Singh defeated Congress candidate Raj Babbar by a massive margin of 5,67,260 votes. Singh is facing the 'Mahagathbandhan' candidate Suresh Bansal and Congress candidate Dolly Sharma. Ghaziabad was created after the delimitation process in 2009 and BJP's Rajnath Singh emerged victorious from it that time. Earlier, the seat was known as Hapur and it was won by BJP candidate Ramesh Chand Tomar four times consecutively in 1991, 1996, 1998 and 1999. Baghpat considered to be a bastion of Ajit Singh and his father former prime minister Charan Singh. But BJP's Satya Pal Singh, who was the former Mumbai Police commissioner, defeated Ajit Singh in a big shocker. In fact, Ajit came third in the contest and received only 1,99,516 votes. 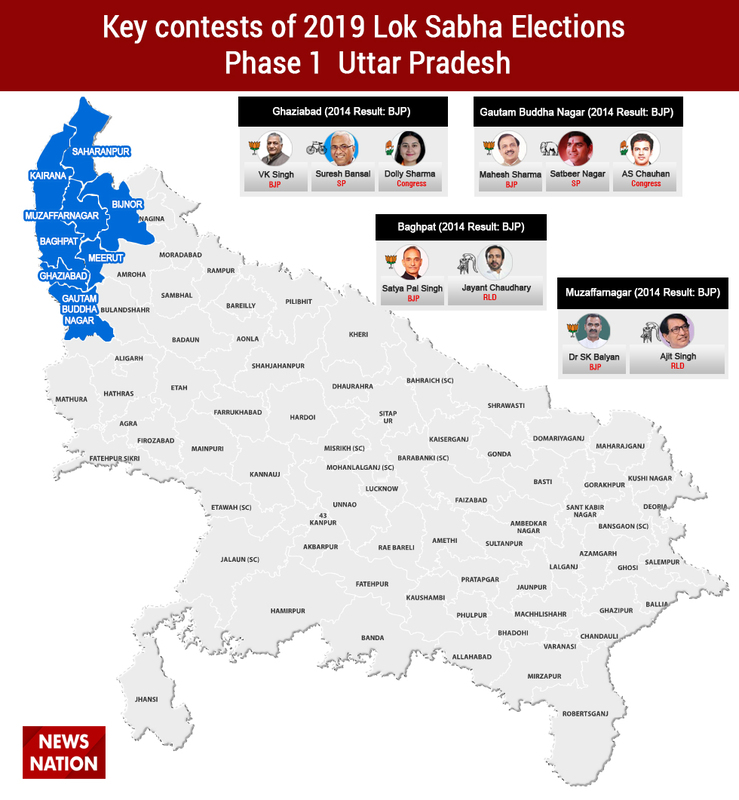 SP's Ghulam Mohammed was the runner-up and lost the elections at the hands of Satya Pal by a margin of 2,09,866 votes. Ajit lost the seat in 1998 also when he was defeated by BJP's Sompal Singh Shastri. Ajit Singh won the seat in 1989, 1991, 1996, 1999, 2004 and 2009. Charan Singh represented the seat in 1977, 1980 and 1984. Now, Charan Singh's grandson and Ajit Singh's son Jayant Chaudhary will try to avenge his father's humiliating defeat in these elections with the backing of Mayawati's BSP and Akhilesh Yadav's SP. The Congress won the seat only once in 1971. Union Minister Mahesh Sharma has been pitted against Congress candidate Arvind Singh Chauhan and BSP's Satbeer Nagar. In 2014, Sharma won the seat by a margin of 2,80,212 votes and defeated SP's Narendra Bhati. In 2009, BSP's Surendra Singh Nagar won the seat. Former Union minister Ajit Singh will take on BJP's Sanjeev Kumar Balyan in Muzaffarnagar as a joint candidate of the 'Mahagathbandhan'. Singh lost his traditional Baghpat seat in 2014 and decided to shift his base to Muzaffarnagar. In 2014, Balyan defeated BSP's Kadir Rana by a huge margin of 4,01,150 votes. In the last seven elections, the BJP won the seat four times in 1991, 1996, 1998 and 2014. The Congress, the SP and the BSP won it in 1999, 2004 and 2009 respectively. Union Minister Kiren Rijiju will have to witness a tough contest in Arunachal West as he has to face former state chief minister and senior Congress leader Nabam Tuki in the upcoming polls. In 2014, Rijiju defeated Congress candidate Takam Sanjoy by 41,738 votes. Rijiju had won the elections from the same constituency in 2004 but lost it in 2009 against Sanjoy. The seat has been a Congress bastion as the party was successful on it seven times. National Conference candidate Muhammad Akbar Lone is contesting the elections against PDP's Abdul Qayoom Wani and Congress candidate Haji Farooq Mir. 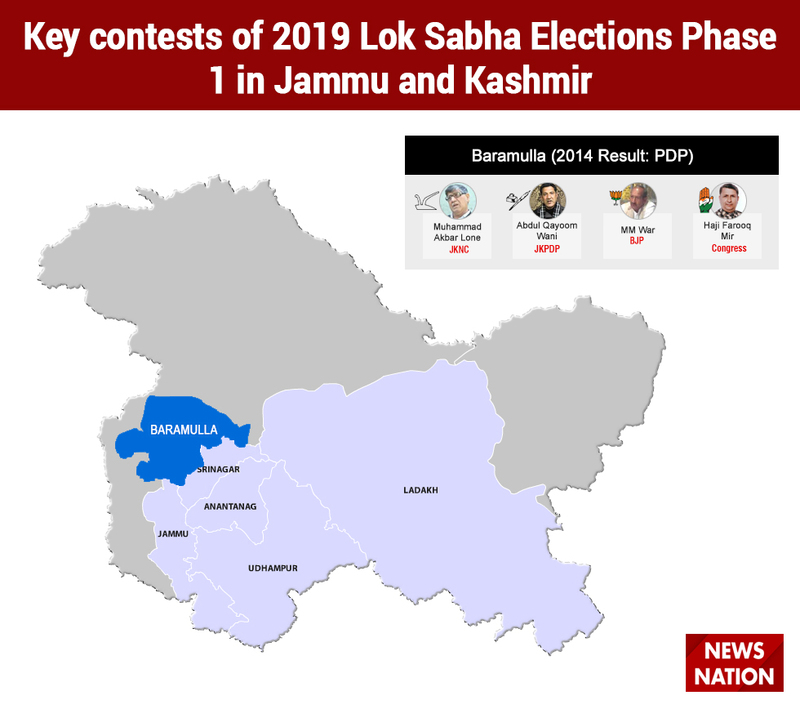 In 2014, PDP's senior leader Muzaffar Hussain Baig won the seat when he defeated National Conference leader and sitting MP Sharifuddin Shariq by 29,219 votes. In the last seven elections, the National Conference won the seat in 1989, 1998, 1999, 2004 and 2009. The Congress won the seat in 1996. Tura has been a bastion of Sangma family since ages. PA Sangma represented the seat for a record 9 terms in 1977, 1980, 1984, 1991, 1996, 1998, 1999, 2004 and 2014. His daughter Agatha Sangma won the seat in 2009 on an NCP ticket and now again contesting from the NPP, the party founded by her father. 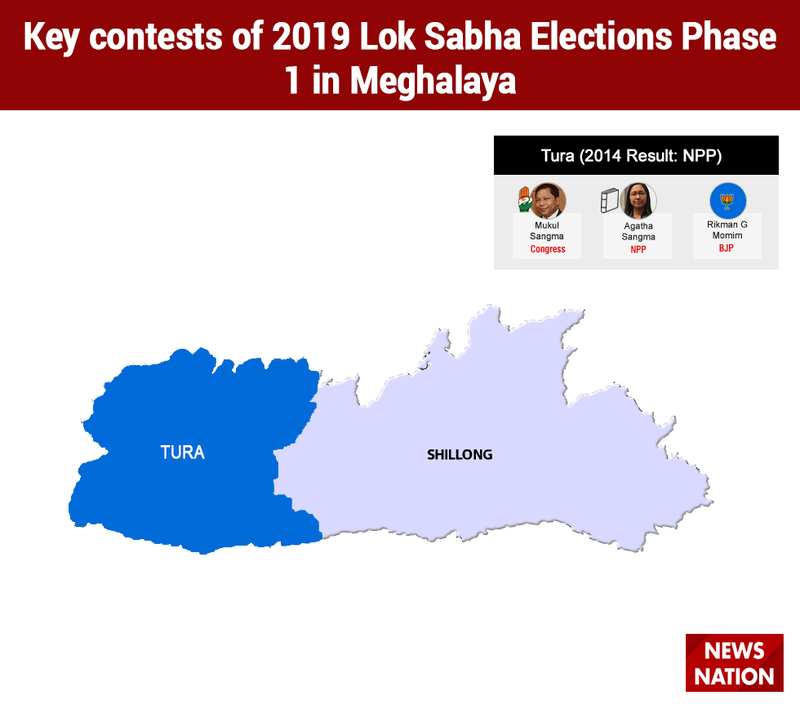 Conrad Sangma, the Meghalaya Chief Minister and son of PA Sangma, won a bypoll in 2016 after his father's demise. Agatha is facing a resurgent Congress this time under former chief minister Mukul Sangma. In 2014, PA Sangma defeated Congress candidate Daryl Willian Ch Momin by 39,716 votes. 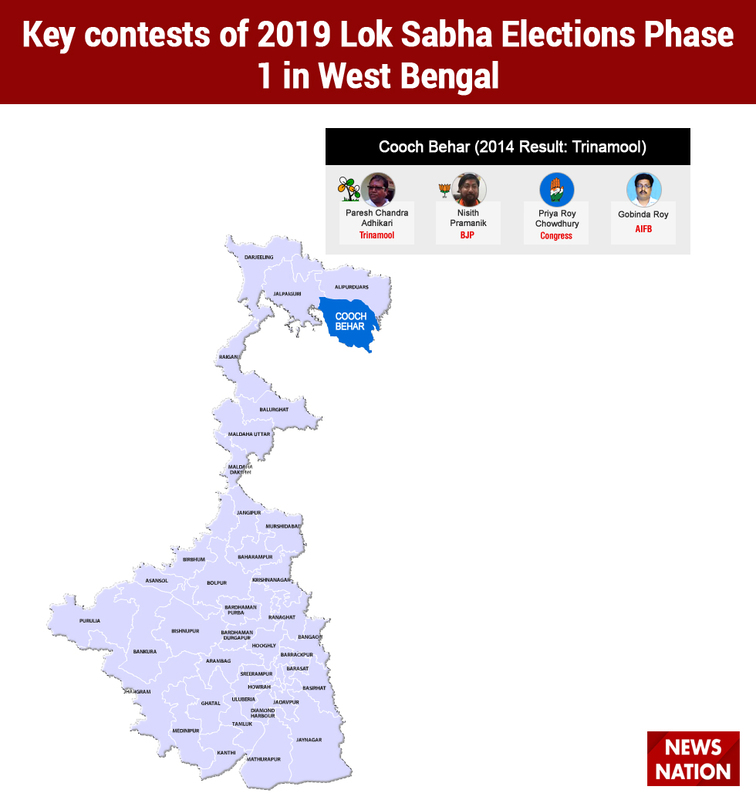 Cooch Behar has been All India Forward Bloc's (AIFB) stronghold but the Trinamool Congress trumped it in the 2014 polls and repeated its success in the 2016 bypolls that were necessitated after the death of sitting MP Renuka Sinha. Sinha defeated AIFB candidate Dipak Kumar Roy in 2014 by a margin of 87,107 votes. Trinamool's Partha Pratim Roy won a bypoll in 2016 that saw the BJP emerging as the runner up. The Trinamool Congress has given its ticket to Paresh Chandra Adhikari this time. AIFB's Amarendranath Roy Pradhan won the seat for 8 consecutive terms. The Congress party last won it in 1971. 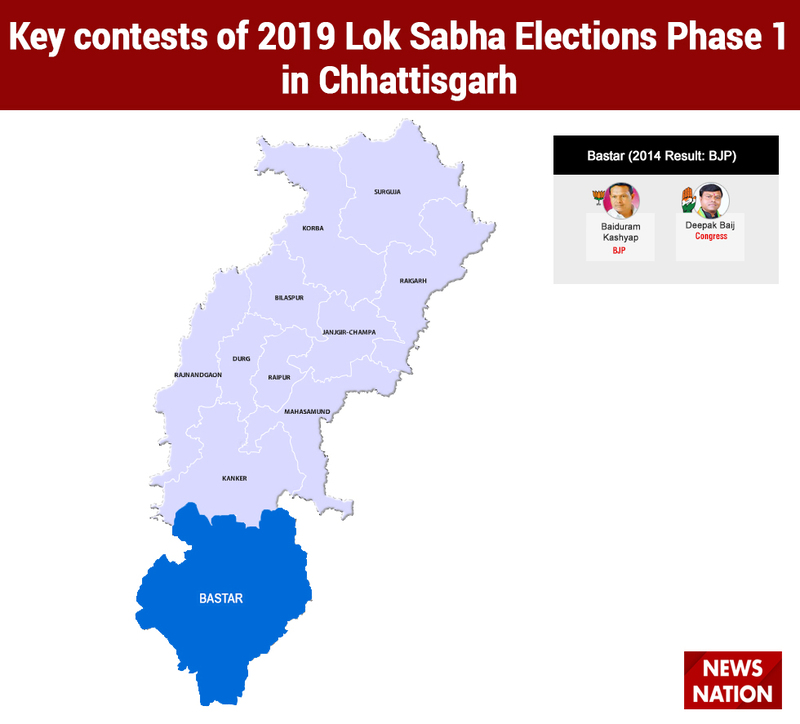 The BJP has changed all its candidates in Chhattisgarh after its debacle in the recently-held Assembly elections. Party's Baiduram Kashyap will face Congress candidate Deepak Baij in the elections. In 2014, BJP's Dinesh Kashyap defeated Congress candidate Deepak Karma by 1,24,359 votes. The BJP has been winning this seat since 1998 (including a bypoll in 2011). Baliram Kashyap won the seat for the saffron party for four consecutive terms in 1998, 1999, 2004 and 2009. The Congress last won the elections in Bastar in 1991. Mahendra Karma won the seat as an independent candidate in 1996. Former Assam chief minister Tarun Gogoi's son Gaurav Gogoi will try to win the Kaliabor seat for the second consecutive time. In 2014, Gogoi won the seat by defeating his nearest rival of BJP's Mrinal Kumar Saikia by 93,874 votes. The seat has been a Congress stronghold as the party lost it only twice in 1984 and 1996. Tarun Gogoi represented the seat thrice in 1991, 1998 and 1999. AGP candidate Mani Madhab Mahanta will try to stop the Congress juggernaut with the BJP's backing. 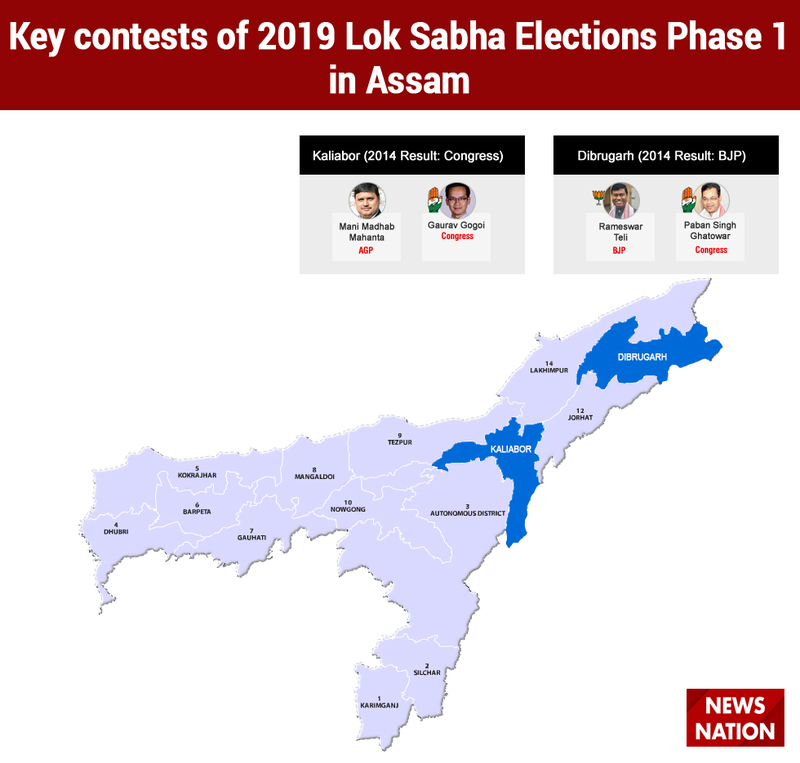 Dibrugarh will see a tough contest between the incumbent BJP MP Rameswar Teli and Congress candidate Paban Singh Ghatowar. Ghatowar has represented the constituency five times in 1991, 1996, 1998, 1999 and 2009. He lost the elections to Teli in 2014 by a big margin of 1,85,347 votes. Assam Chief Minister and BJP leader Sarbananda Sonowal also defeated Ghatowar in 2004 elections as an AGP candidate. The Congress has been winning the seat since 1951. BJP's Uttarakhand stater president Ajay Bhatt will face Harish Rawat, former chief minister, in Nainital-Udhamsingh Nagar. In 2014, BJP's senior leader Bhagat Singh Koshyari defeated Congress candidate KC Singh Baba by a massive margin of 2,84,717 votes. Baba won the seat for the Congress party in 2009 after the delimitation process. Earlier, the seat was known as Nainital only and the BJP won it only twice in 1991 and 1998. Narayan Dutt Tiwari represented the seat in 1980, 1996 and 1999. Krishna Chandra Pant also represented the seat thrice in 1962, 1967 and 1971. In 1998, Pant's wife Ila Pant defeated Tiwari on a BJP ticket. Former Uttarakhand chief minister Ramesh Pokhriyal Nishank won the Haridwar seat in 2014 and defeated Harish Rawat's wife Renuka Rawat by a margin of 1,77,822 votes. Nishank is seeking a second term from the seat. The BJP won the seat five times in 1991, 1996, 1998, 1999. The party won the seat again in 2014 after a gap of 10 years. BJP's Harpal Singh Sathi represented the seat thrice whereas Congress leader Harish Rawat also represented the seat once in 2009. BJP's senior leader and former chief minister Bhuwan Chandra Khanduri won the Garhwal Lok Sabha constituency for the fifth time in 2014 defeating Congress party's Harak Singh Rawat by 1,84,526 votes. Khanduri represented the seat in 1991, 1998, 1999 and 2004 also. Satpal Maharaj also represented the seat in 1996 and 2009. The BJP has decided to give its ticket to Tirath Singh Rawat this time from the seat whereas the Congress pulled up a surprise when it chose Khanduri's son Manish Khanduri to contest the elections. LJP chief and Union Minister Ram Vilas Paswan's son Chirag Paswan is again contesting from Jamui. In 2014, Chirag won the seat by 85,947 votes. Bhudeo Chaudhary, who won the seat in 2009 as a JDU candidate, will represent the RLSP this time. Former Bihar chief minister Jitan Ram Manjhi is locked in a tough contest with JDU candidate Vijay Kumar Manjhi in Gaya. 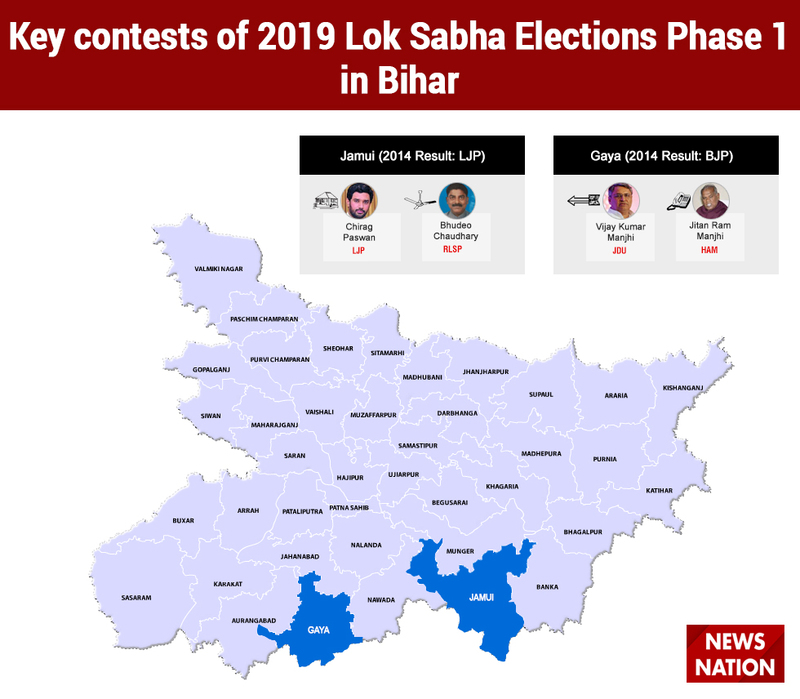 The seat was won by the BJP in 2009 and 2014 but it was granted to the JDU to contest due to a seat-sharing arrangement in the state in 2019. In the last seven elections, the seat was represented by the BJP four times. The Janata Dal won it in 1991 and 1996 whereas the RJD won it in 2004. Jitan Ram Manjhi came at the third spot in the previous elections. Bhakta Charan Das will again try to win Kalahandi seat in 2019 as he will take on BJP's Basanta Kumar Panda and BJD's Pushpendra Singh Deo. In 2014, BJD candidate Arka Keshari Deo won the seat by defeating BJP's Pradeep Kumar Naik by 56,347 votes. Das came third in the 2014 elections. In the last eight elections, Das won the seat thrice in 1989, 1996 and 2009. The BJP also represented the seat thrice in 1998, 1999 and 2004 when they were in an alliance with the Naveen Patnaik-led BJD. Koraput was a fiefdom of Congress leader Giridhar Gamang till 2009 when he lost the elections for the first time at the hands of BJD candidate Jayaram Pangi. Gamang represented the seat 8 times from 1972 to 1999 and left the seat for his wife Hema in 1999. Hema Gamang won the seat remained an MP till 2004 when Gamang again won the seat. In 2014, BJD's Jhina Hikaka defeated Gamang by 19,328 votes. Pangi, who defeated Gamang for the first time, is taking on the new BJD candidate this time. Gamang has also joined the BJP. Nagpur has been yet another Congress bastion since Independence. The BJP won the seat twice in 1996 and 2014. BJP's Nitin Gadkari defeated Congress leader Vilas Muttemwar by 2,84,848 votes in 2014. Muttemwar won the seat four consecutive times in 1998, 1999, 2004 and 2009. The BJP won the seat in 1996 when Banwarilal Purohit got elected on a party ticket for the first time. Purohit represented the seat in 1984 and 1989 also as a Congress representative. Gadkari is facing Nana Patole, who won on a BJP ticket from Bhandara-Gondiya in 2014 and later joined the Congress party, in Nagpur. Chandrapur is one of the Lok Sabha seats in Maharashtra that will vote in the first phase. BJP leader Hansraj Gangaram Ahir will face Congress candidate Suresh Dhanorkar this time. In 2014, Ahir defeated Congress candidate Sanjay Wamanrao Deotale by 2,36,269 votes. Ahir has been winning Chandrapur since 2004. He won the seat for the saffron party for the first time in 1996. In the last seven elections, the BJP won the seat 4 times whereas the Congress party emerged victorious thrice in 1991, 1998 and 1999. Nizamabad will see a contest between KCR's daughter Kavitha and Congress leader Madhu Yaskhi Goud again this time. In 2014, Kavitha defeated Goud by a healthy margin of 1,67,184 votes. Goud represented the seat twice in 2004 and 2009 before his defeat in 2014. In the last seven elections, the seat was won by the TDP and the Congress three times respectively. The TRS won the seat for the first time in 2014. Hyderabad has been a bastion of the AIMIM over the years. Party's leader Asaduddin Owaisi won the seat thrice in 2004, 2009 and 2014. In 2014, Owaisi defeated BJP's Bhagwanth Rao by 2,02,454 votes. Rao is again challenging Owaisi in 2019. The Congress has also fielded Firoz Khan from the seat whereas the ruling TRS is backing Owaisi. The seat was represented by Owaisi's father Salahuddin Owaisi six times in from 1984 to 2004. The Congress won the seat last time in 1980. Congress state chief Uttam Kumar Reddy will take on TRS leader V Narasimha Reddy and BJP's Jithender Kumar in Nalgonda. Gutha Sukender Reddy of Congress won the seat in 2009 and 2014. He represented the seat in 1998 also but as a TDP candidate. The CPI also won the seat six times in 1952, 1957, 1991, 1996, 1998 and 2004. CPI general secretary S Sudhakar Reddy won the seat in 1998 and 2004. Khammam saw an immensly close battle in 2014 when YSRCP candidate P Srinivasa Reddy defeated TDP leader Nama Nageswara Rao by just 12,204 votes. Rao has joined the TRS now and will face Congress candidate Renuka Choudhary in the constituency. Renuka won the seat in 1999 and 2004 but lost it in 2009 when Rao defeated her by over 1 lakh margin. In the last seven elections, the Congress won the seat 4 times whereas the CPM, the TDP and the YSRCP represented the seat in 1996, 2009 and 2014 respectively.